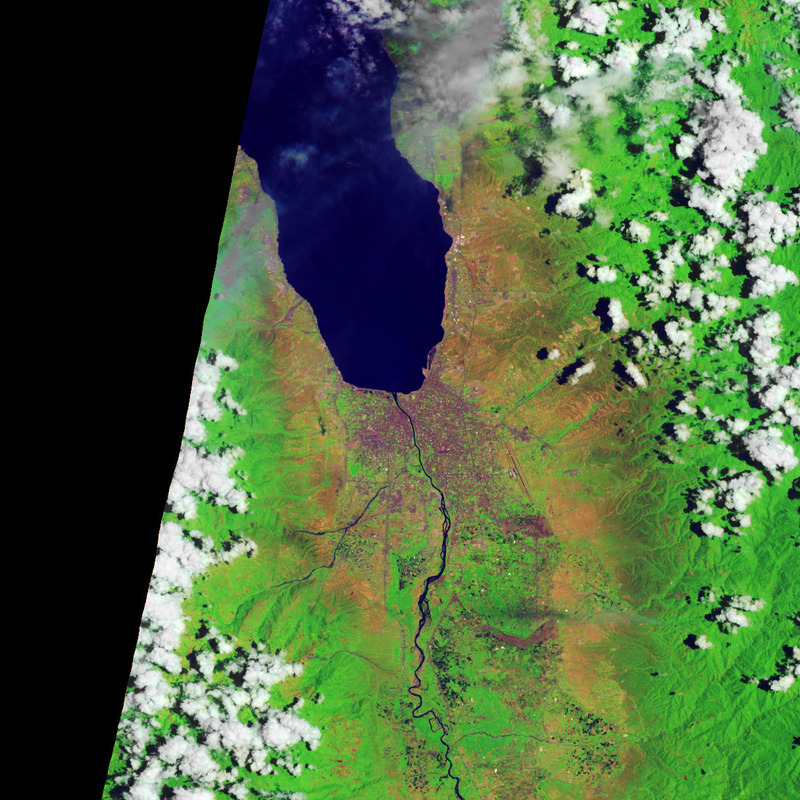 The powerful, shallow earthquake that rattled the northern coast of Sulawesi island on September 28, 2018, caused tremendous damage. 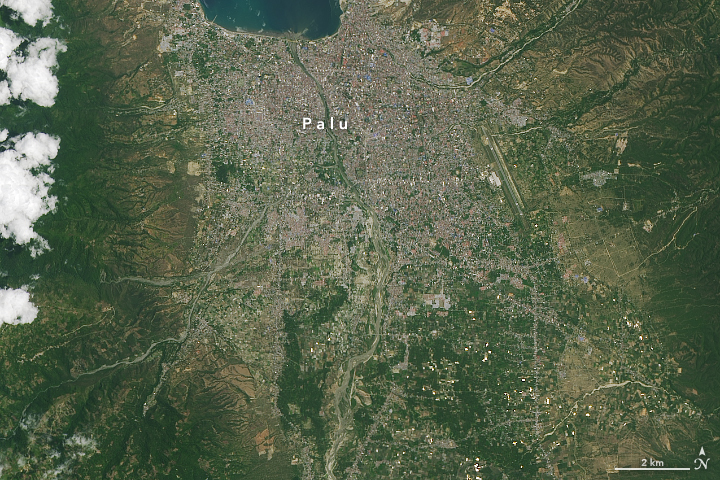 Homes throughout Palu, Indonesia, have been flattened. A series of tsunami waves decimated the coastline. Destructive flows of mud and soil destroyed several inland areas in the city of 300,000 people. 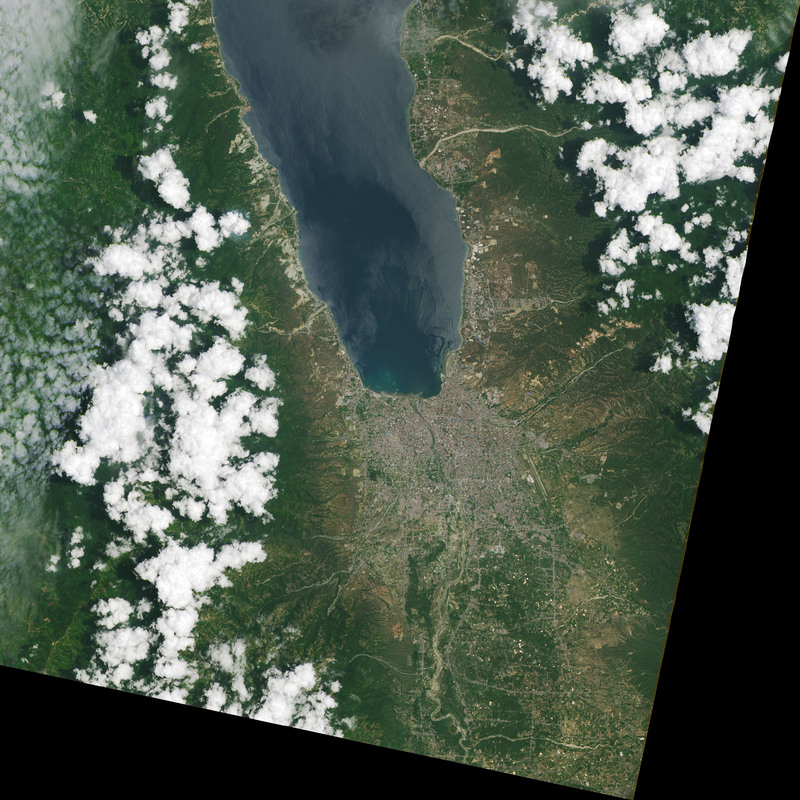 The Operational Land Imager (OLI) on Landsat 8 captured a natural-color image of Palu on October 2, 2018. 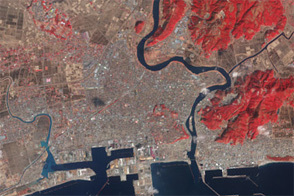 The second image shows the same area before the earthquake and tsunami. The false-color (bands 6-5-2) images make it easier to distinguish between urban areas (purple-gray), vegetation (green), and upturned soil (brown and tan). 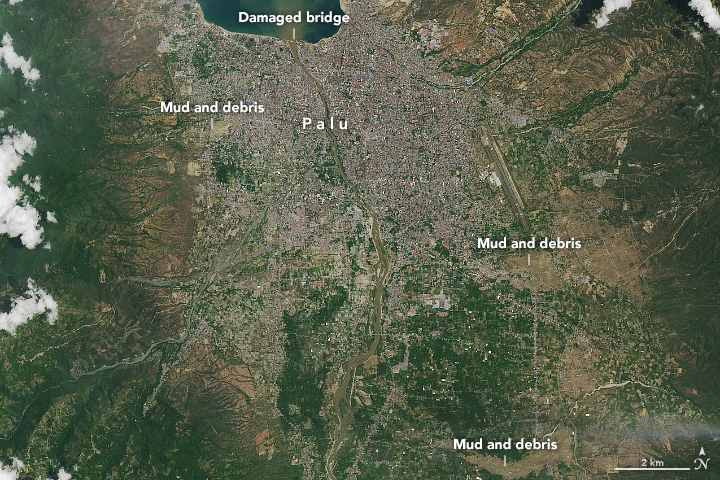 While coastal areas took heavy damage because of the tsunami, the image also reveals three large inland flows of mud that caused severe damage in densely populated areas. Intense shaking from the earthquake may have triggered liquefaction and lateral spreading, processes in which wet sand and silt takes on the characteristics of a liquid. These processes, which are especially common near streams and on reclaimed land, can produce destructive mudslides even in relatively flat areas. 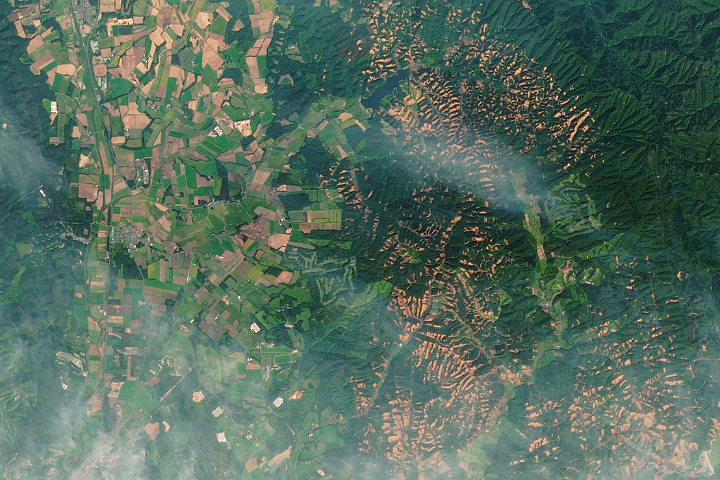 Scientists were surprised that the earthquake generated such a big tsunami. 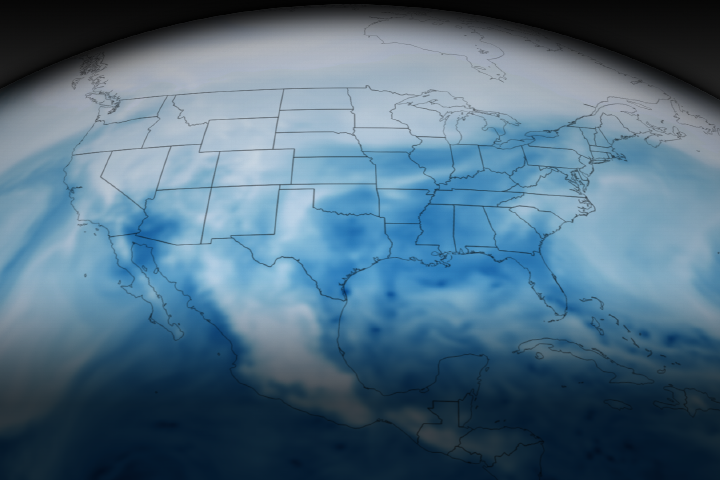 Normally, large tsunamis occur after megathrust earthquakes that cause vertical displacement. But the Sulawesi earthquake occurred along a strike-slip fault, meaning the motion was horizontal. 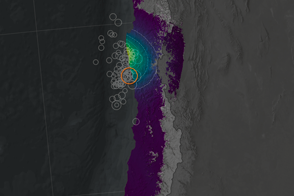 Some scientists suspect that a submarine landslide, shaken loose by the earthquake, may have provided the energy that fueled the destructive tsunami. 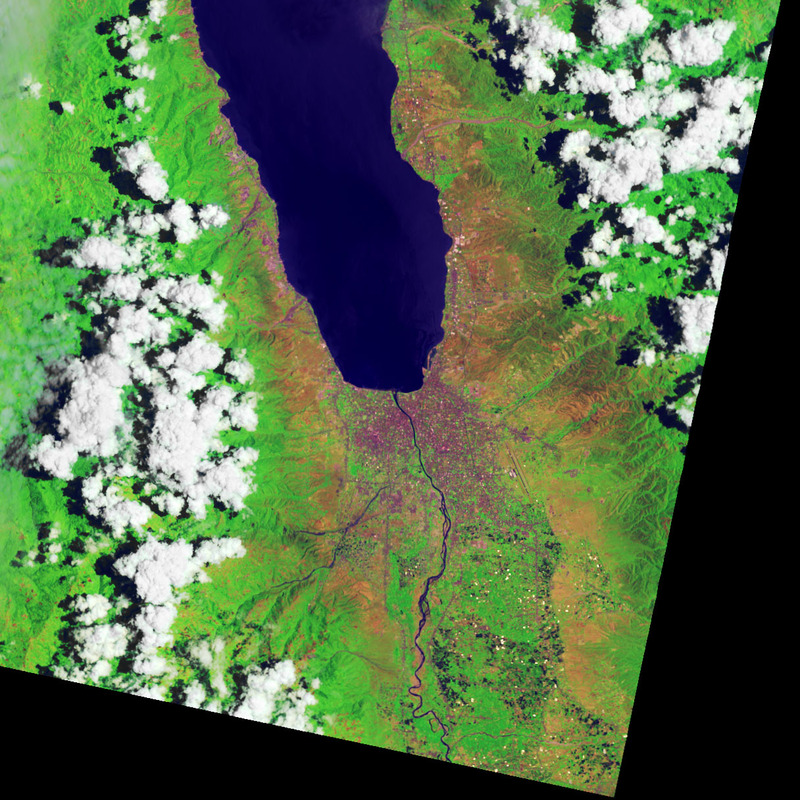 In addition, the narrow, finger-like shape of Palu Bay likely amplified the fast-moving surge of water and made it even more dangerous. Hall, R. (2018, October 1) Sulawesi Earthquake and Tsunami. Accessed October 2, 2018. Jakarata Globe (2018, October 1) Hundreds More Feared Buried After Soil Became Liquid in Quake-Hit Palu. Accessed October 2, 2018. National Geographic (2018, October 1) The Science of Indonesia’s Surprise Tsunami. Accessed October 2, 2018. Reliefweb (2018, October 2) Indonesia: Tsunami/Earthquakes - Sep 2018. Accessed October 2, 2018. Reuters (2018, October 2) Explainer: What is liquefaction? Accessed October 2, 2018. The Conversation (2018, October 1) Would a better tsunami warning system have saved lives in Sulawesi? Accessed October 2, 2018. 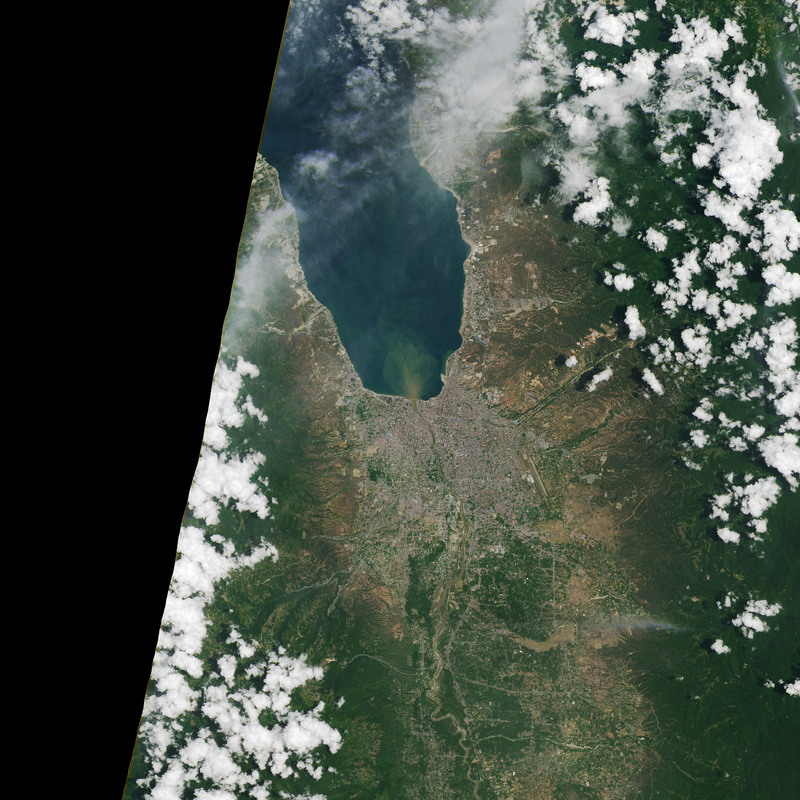 The Landslide Blog (2018, October 2) Giant landslides in Palu from the 2018 Sulawesi earthquake. Accessed October 2, 2018. The Jakarta Post (2018, September 29) Central Sulawesi quake: What we know so far. Accessed October 2, 2018. The Jakarta Post (2018, October 1) Chaos in Palu after quake as survivors deal with hunger, thirst. Accessed October 2, 2018. The New York Times (2018, September 30) Indonesia Tsunami’s Power After Earthquake Surprises Scientists. Accessed October 2, 2018. Reuters (2018, October 1) What is liquefaction? Accessed October 2, 2018. 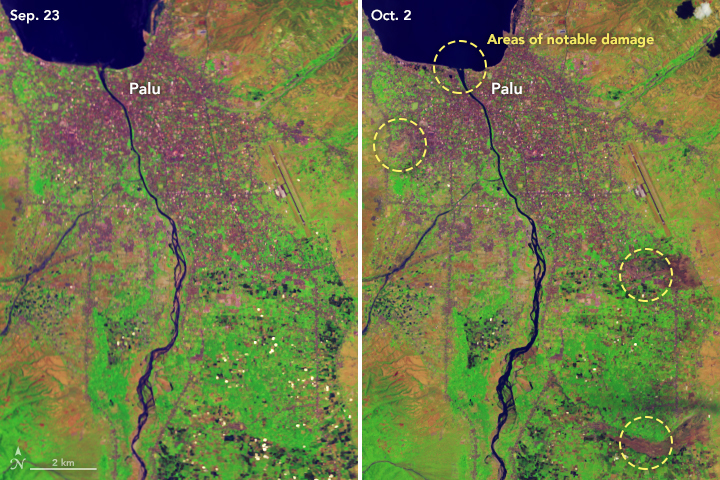 Scientific American (2018, October 1) A Very Unusual Tsunami: The 2018 Sulawesi Earthquake. Accessed October 2, 2018. U.S. Geological Survey (2018, September 28) Magnitude 6.7 Earthquake in Japan. Accessed October 2, 2018.